SystemZHazardRecognizer maintains the state for one MBB during scheduling. Definition at line 45 of file SystemZHazardRecognizer.h. Definition at line 110 of file SystemZHazardRecognizer.h. References EmitInstruction(), getHazardType(), and Reset(). Copy counters from end of single predecessor. Definition at line 451 of file SystemZHazardRecognizer.cpp. Referenced by emitInstruction(), llvm::SystemZPostRASchedStrategy::enterMBB(), and getLastEmittedMI(). Definition at line 208 of file SystemZHazardRecognizer.cpp. Referenced by dumpState(), EmitInstruction(), and Reset(). Definition at line 223 of file SystemZHazardRecognizer.cpp. References llvm::dbgs(), llvm::TargetSchedModel::getNumProcResourceKinds(), llvm::TargetSchedModel::getProcResource(), and llvm::MCProcResourceDesc::Name. Definition at line 248 of file SystemZHazardRecognizer.cpp. References llvm::SmallVectorImpl< T >::assign(), llvm::dbgs(), dumpCurrGroup(), dumpProcResourceCounters(), and llvm::TargetSchedModel::getNumProcResourceKinds(). Referenced by llvm::SystemZPostRASchedStrategy::enterMBB(), llvm::SystemZPostRASchedStrategy::initialize(), and Reset(). Definition at line 167 of file SystemZHazardRecognizer.cpp. References llvm::MCSchedClassDesc::BeginGroup, llvm::MCSchedClassDesc::EndGroup, llvm::SUnit::getInstr(), llvm::MachineInstr::getOpcode(), llvm::TargetSchedModel::getProcResource(), getSchedClass(), llvm::TargetSchedModel::getWriteProcResBegin(), llvm::TargetSchedModel::getWriteProcResEnd(), llvm::SUnit::isUnbuffered, llvm::MCSchedClassDesc::isValid(), llvm::MCProcResourceDesc::Name, llvm::SUnit::NodeNum, and llvm::MCSchedClassDesc::NumMicroOps. Referenced by EmitInstruction(), and llvm::SystemZPostRASchedStrategy::pickNode(). Definition at line 271 of file SystemZHazardRecognizer.cpp. References assert(), llvm::MCProcResourceDesc::BufferSize, CurGroupDbg, llvm::dbgs(), dumpCurrGroup(), dumpSU(), llvm::MCSchedClassDesc::EndGroup, llvm::SUnit::getInstr(), llvm::TargetSchedModel::getProcResource(), getSchedClass(), llvm::TargetSchedModel::getWriteProcResBegin(), llvm::TargetSchedModel::getWriteProcResEnd(), llvm::SUnit::isCall, llvm::SUnit::isUnbuffered, LLVM_DEBUG, llvm::MCProcResourceDesc::Name, ProcResCostLim, and Reset(). 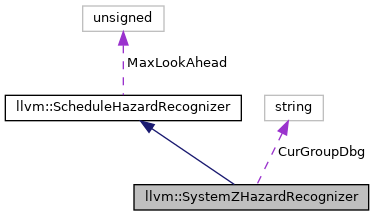 Referenced by emitInstruction(), isBranchRetTrap(), llvm::SystemZPostRASchedStrategy::schedNode(), and SystemZHazardRecognizer(). Wrap a non-scheduled instruction in an SU and emit it. Definition at line 410 of file SystemZHazardRecognizer.cpp. References assert(), llvm::MCProcResourceDesc::BufferSize, copyState(), EmitInstruction(), llvm::TargetSchedModel::getProcResource(), llvm::TargetSchedModel::getWriteProcResBegin(), llvm::TargetSchedModel::getWriteProcResEnd(), llvm::SUnit::hasReservedResource, isBranchRetTrap(), llvm::SUnit::isCall, llvm::MachineInstr::isCall(), llvm::MachineInstr::isTerminator(), llvm::SUnit::isUnbuffered, llvm::make_range(), and llvm::TargetSchedModel::resolveSchedClass(). Referenced by llvm::SystemZPostRASchedStrategy::enterMBB(), getSchedClass(), and getSingleSchedPred(). Definition at line 77 of file SystemZHazardRecognizer.cpp. Definition at line 153 of file SystemZHazardRecognizer.h. Resolves and cache a resolved scheduling class for an SUnit. Definition at line 121 of file SystemZHazardRecognizer.h. References emitInstruction(), llvm::SUnit::getInstr(), groupingCost(), llvm::TargetSchedModel::hasInstrSchedModel(), llvm::TargetSchedModel::resolveSchedClass(), resourcesCost(), and llvm::SUnit::SchedClass. Referenced by dumpSU(), EmitInstruction(), groupingCost(), llvm::SystemZPostRASchedStrategy::releaseTopNode(), Reset(), and resourcesCost(). Return the cost of decoder grouping for SU. If SU must start a new decoder group, this is negative if this fits the schedule or positive if it would mean ending a group prematurely. For normal instructions this returns 0. Definition at line 340 of file SystemZHazardRecognizer.cpp. References assert(), llvm::MCSchedClassDesc::BeginGroup, llvm::MCSchedClassDesc::EndGroup, llvm::SUnit::getInstr(), getSchedClass(), llvm::SUnit::isUnbuffered, llvm::MCSchedClassDesc::isValid(), and resourcesCost(). Referenced by getSchedClass(), and llvm::SystemZPostRASchedStrategy::pickNode(). Definition at line 81 of file SystemZHazardRecognizer.cpp. References assert(), llvm::MCSchedClassDesc::BeginGroup, CurGroupDbg, dumpCurrGroup(), dumpState(), llvm::MachineInstr::getDesc(), llvm::SUnit::getInstr(), llvm::MCInstrDesc::getNumDefs(), llvm::MCInstrDesc::getNumOperands(), llvm::TargetSchedModel::getNumProcResourceKinds(), llvm::MCInstrDesc::getOperandConstraint(), llvm::MachineBasicBlock::getParent(), llvm::MachineInstr::getParent(), llvm::SystemZInstrInfo::getRegisterInfo(), getSchedClass(), llvm::MCSchedClassDesc::isValid(), LLVM_DEBUG, MI, ProcResCostLim, llvm::MCOI::TIED_TO, and TRI. Referenced by EmitInstruction(), and SystemZHazardRecognizer(). Return the cost of SU in regards to processor resources usage. A positive value means it would be better to wait with SU, while a negative value means it would be good to schedule SU next. Definition at line 387 of file SystemZHazardRecognizer.cpp. References getSchedClass(), llvm::TargetSchedModel::getWriteProcResBegin(), llvm::TargetSchedModel::getWriteProcResEnd(), llvm::SUnit::isUnbuffered, and llvm::MCSchedClassDesc::isValid(). Referenced by getSchedClass(), groupingCost(), and llvm::SystemZPostRASchedStrategy::pickNode(). Definition at line 146 of file SystemZHazardRecognizer.h. Referenced by copyState(), dumpCurrGroup(), EmitInstruction(), and Reset().